My unbeaten run came to 15 matches in the league and 24 matches overall. This included an 11-game winning streak in the league. During this time, I won 3 consecutive Manager of the Month awards (Aug - Sept). As for the Champions' League, I easily vanquished Monaco and Inter Milan by 3-0 before handing out an easy draw with Herfolge (1-1). I kept my end of the promise as Arsenal took a step further in the European stage. 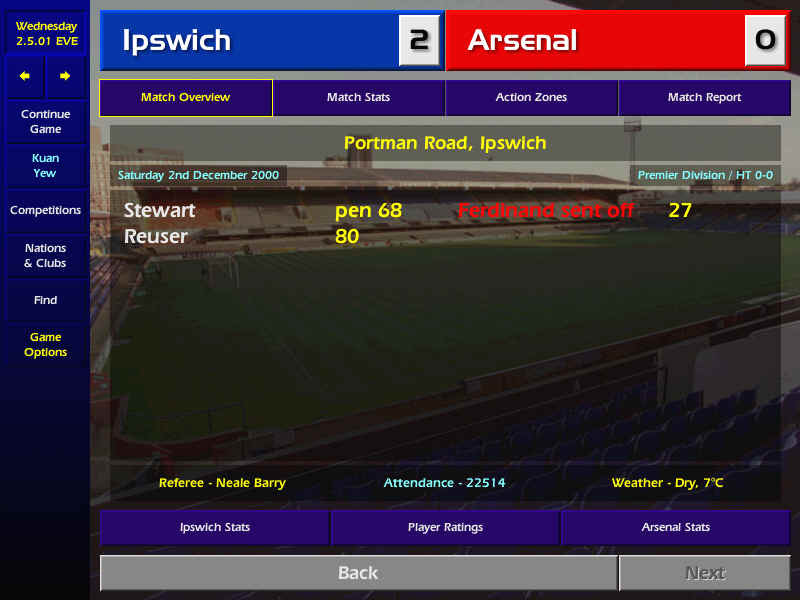 My amazing achievement came to a sudden halt when I underestimated newly promoted Ipswich. A below par performance from my lads led to a shock 2-0 defeat. [ScreenShot] The period between 2nd Dec till 20 Jan became bleak as Arsenal's form took a dip. We promptly drew 3-3 at The Dell and then came the Boxing Day encounter with Manchester United. We drew 2-2 against them, which saw Chelsea cutting away our lead at the top of the table. The only bright spark during this period came when the young Gunners team managed to win the Cup ties. Barrett stunned everyone with his goal-scoring exploits. Just when I thought Arsenal was beginning to come out from their slump, Leeds United blew those thought away with a numbing 4-1 thrashing. Comforting news elsewhere, we had Leverkuersen, Olympiakos and Real Madrid in our Phase 2 group. From my judgement, I knew that we could easily qualify along with Real Madrid and that was proven when we defeated the defending champions 3-1 at Highbury. The New Year could be a dawn of a new era for Arsenal as we chase for glory on all fronts. I rested a few first team players and gave a number of promising Reserve team youngsters a place in the squad. Although Arsenal never managed to regain their early season form, our performances were very much appreciated. With more than half of the season gone, Arsenal still held a slender 5-point lead in the standings. Second-placed Chelsea came visiting and I knew that the outcome of the match would decide who could sustain a championship-winning run. The Blues had managed to close the gap and we need to win and gain some room to breathe. In the end, the 5-2 win goes to show that they will have to strive much more harder to knock us off the top spot. I told the lads that it was time to buck up and give their all. Chelsea was blown to smithereens and the title is nearly in our grasp. In the draw for the 4th round of the FA Cup, our name came first and guess who was drawn out next? Lo and behold, our closest rivals Tottenham! The Spurs faithful have gone on and on about winning the FA Cup since 5 of their previous cup victories came in the year that ends with 1. Our scalp was theirs to take as they thought their past glory would help them this time around. With all due respect, I had my mind set on winning and whether the year ends in 1 or not, is none of my concern. The Highbury faithful gave a deafening roar at the blow of the final whistle. Tottenham fans were left awestruck and at a loss for words when the Press interviewed them after the match. Arsenal's stunning display in the early season 7-0 win at White Hart Lane was on show again and although the final score was only 5-0, I had managed to rub salt in their wounds. Where was their pre-destined victory? I commented to the Press afterwards. Arsenal's domestic cup run was better than I had imagined. The Reserve squad managed to win their respective matches that saw us heading closer and closer to Cup glory. Manchester City put up a brave front in the League Cup semi-finals before succumbing to a 3-1 defeat on aggregate. The Champions League recommenced and we were up against Leverkuersen. A 3-1 win at home and a 3-2 win away saw us qualifying for the quarter-finals with 2 matches left to play. Our erratic form for the past 2 months was soon forgotten as I looked towards the future. We handed Real Madrid a 3-0 hammering at the Santiago Bernabeu Stadium but I was already focusing on our quarter-final opponent, Porto. Spanish sides still dominated the last 8 with Barcelona, Real Madrid and Valencia. Juventus and AC Milan represented Italy. Porto, Bayern Munich and us made up the rest.